I recently went on a mindfulness retreat. Before leaving I was not necessarily looking forward to it. Not as in ‘Yeah! Mindfulness retreat!’. Because I’ve been there, done that and… believe me: it’s not always a walk in the park… But I knew it was the right thing to do… so, I went. And… all of this in silence. Is that it? Yes, while meditating all the time, of course. On a typical day, the bell wakes you up at 5.30, the first sitting meditation starts at 6 am. 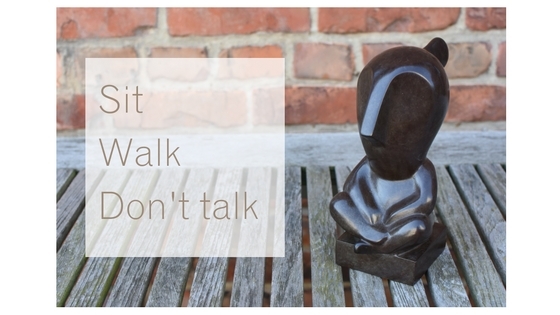 Each sitting meditation is alternated by a walking meditation (and yes we do eat, we even have some chores – all done in silence) and the last one finished at 9.30 pm. So the day is very structured and everything is organised for you. And what is the definition of meditating? Paying attention to whatever presents itself, as long as it presents itself. Basically you want to exercise your ‘attention muscle’. And how do you do that? You start by focusing on your breath. This is your basic object of observation. You notice how the air enters and leaves your body and where you notice this (nostrils, abdomen, …). After a while, when some degree of concentration is developed, new objects of attention may be added: the body, physical sensations, thinking, emotions … The idea is that when one of these objects presents itself (eg. you start to think about everything you still need to do after the retreat…), that you notice that your mind wanders off, and that you ‘label’ this as ‘thinking’ or ‘planning’. Sometimes the mere noticing of the thought makes it disappear. Sometimes you’ll notice your thoughts stay there and you just keep on noticing ‘planning’, ‘thinking’, without going into the context. After a while you may notice that another ‘object’ comes to the foreground: for example a physical sensation: your leg starts to hurt (sitting still for a long time in one position can do that to you…). Again, you will label this as ‘feeling’ or ‘pain’… And whenever nothing presents itself, you go back to the basic object of your breathing. So, if it’s not relaxing, why? By practicing paying attention you get to know yourself better. You start to notice certain patterns, certain thoughts that keep on coming back. And believe me, this can be very confronting… However, this will be very useful when you go back to ‘normal life’. Here too you will be triggered but you might recognize certain patterns, automatic reactions and … choose to react differently. So instead of shouting back when somebody raises his voice to you, you notice whatever happens inside of you when he does this AND choose not to raise your voice but stay calm (should you want to, of course). Do you need to do a retreat to get these benefits? No, you can also opt for starting on your own (check out this) or doing an eight-week mindfulness course (more info here). So what do you think? Up for some sitting, walking and no talking? As usual I like to read your comments and questions below! If you liked the above, you can sign up for more Tips & Tricks here. Looking forward to hearing from you!